The United States said on Monday it deeply regretted the deaths and injuries caused when Israeli Navy fighters raided Gaza-bound aid ships, leading to at least 10 deaths and dozens of injuries. "The United States deeply regrets the loss of life and injuries sustained, and is currently working to understand the circumstances surrounding this tragedy," said White House spokesman William Burton.. Earlier, the European Union called for a comprehensive enquiry into deaths and urged Israel to allow the free flow of humanitarian aid to the Gaza Strip. At least 10 people were killed in the incident – all activists participating in the flotilla. Six IDF soldiers were among the wounded. The ships were transported to Ashdod, under heavy security of the Navy commando units. "High Representative Catherine Ashton expresses her deep regret at the news of loss of life and violence and extends her sympathies to families of the dead and wounded," said a spokesperson for Ashton, the EU's foreign policy chief. "On behalf of the European Union she demands a full enquiry about the circumstances in which this happened ... She calls for an immediate, sustained and unconditional opening of the crossing for the flow of humanitarian aid, commercial goods and persons to and from Gaza." UN Secretary-General Ban Ki-moon condemned the violence, saying, "I am shocked by reports of killing of people in boats carrying supply to Gaza. I heard the ships were in international water. That is very bad." He called for a "thorough investigation." French President Nicolas Sarkozy condemned "the disproportionate use of force" against the flotilla. "All light must be shed on the circumstances of this tragedy, which underlines the urgency of resuming peace talks," he said in a statement. Spain - the current European Union president - Sweden and Greece summoned the Israeli ambassadors to their capitals to demand explanations, with Madrid slamming the operation as "unacceptable". Greece, which had some 30 nationals on board the flotilla, also withdrew from joint military exercises with Israel in protest at the raid. French Foreign Minister Bernard Kouchner said he was "deeply shocked" by the Israeli raid and insisted "nothing can justify" such violence. British Foreign Secretary William Hague said, ”I deplore the loss of life during the interception of the Gaza Flotilla. Our Embassy is in urgent contact with the Israeli Government. We are asking for more information and urgent access to any UK nationals involved.‪"
Germany's Foreign Minister Guido Westerwelle also said he was "deeply concerned" about the deaths. Kuwait's parliament speaker condemned the storming of the flotilla, which was carrying 16 Kuwaitis including an MP, as a "heinous Israeli crime." On Monday morning, police blocked dozens of protesters who tried to storm the Israeli Consulate in Istanbul. The protesters rioted, hurled stones and called out anti-Israel slurs. 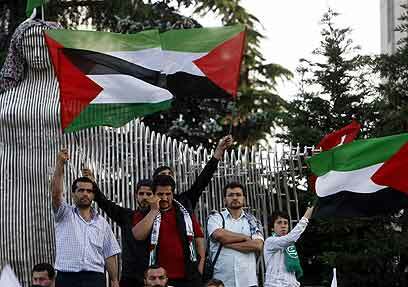 Another protest took place Monday morning in the Jordanian capital of Amman. The al- Jazeera network reported that dozens of protesters are gathered near the Israeli embassy in Amman and are calling to cut diplomatic ties with Israel and cancel the peace agreement between the two countries. Other protests were reportedly taking place in Algeria. No unusual incidents were reported. See all talkbacks "World in shock at deadly Gaza ship raid"